... and hiccups would be punishable by firing squad. 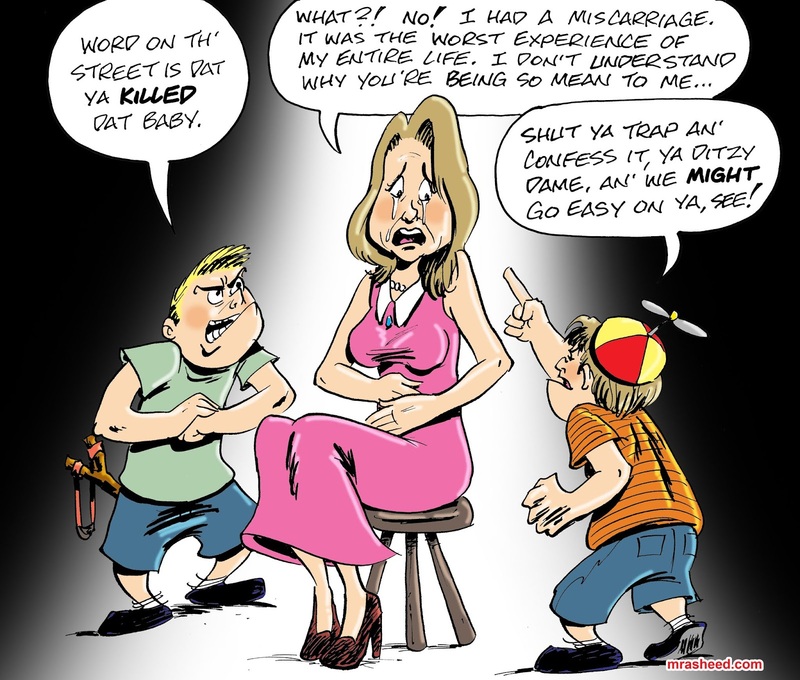 Muhammad Rasheed - If a powerful group of men decided that a miscarriage was actually a DIY abortion attempt and decided to make an example of a certain number of women to maintain their male dominance system through misogynist terror, what would prevent this from happening again? It's not as if that model hasn't repeated itself a trillion times throughout history. Your giggling and dismissal of the professor's very valid point is actually part of this concern. Gary McCoy - And just how would this group of oh-so-spooky powerful men know that said woman had a miscarriage? By their super privacy-invading spy goggles? Muhammad Rasheed - @Gary... The same way people find out people have miscarriages. That's an odd question. Are miscarriages super-secret normally? The point is, officials would use the info to push an agenda. Similar to the way you lot say your political rivals are always pushing their agendas. This isn't an alien concept to you, you're just being disingenuous. @Eric... Right. Because powerful groups of men have never, ever had a history of holding power just for themselves to the exclusion of other groups. Why that is a silly, over-the-top fantasy concept on planet earth, amirite? Gary McCoy - Muhammad, that's a dodge. "The same way people find out people have miscarriages". Have your neighbors told you how many miscarriages they've had in the past month? 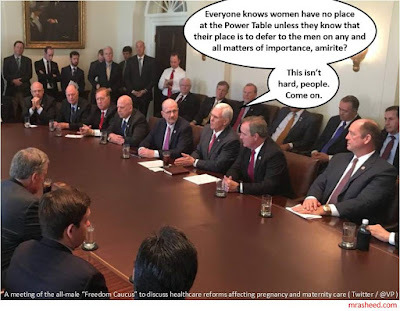 I'll repeat my question (please be specific)... HOW would the evil group of powerful men know if "woman B" down the street had a miscarriage this morning? Hmmmm?????? Muhammad Rasheed - More disingenuity? Obviously the clique of men would include whoever is plugged into the medical community network, with crossover from other networks, right? Isn't that the benefit of having a network with a wide reach? Someone was pregnant and getting their prenatal care and now they aren't pregnant and conspicuously there is no baby. Gary McCoy - What Eric C. Martin said. Beth Donovan - What you all fail to understand is that this is a state issue, not a federal issue. Muhammad Rasheed - ew. who let that girl in here? Beth Donovan - @Muhammad... ew, who let you in here? Muhammad Rasheed - HOW DARE YOU!!!!!! Mark A Miller - And I’m fine with that. Leave it up to each state to decide. I’ve felt that the Supreme Court never should have ruled on it in the first place. Then if you’re adamant about pro-life you probably won’t live in New York or California. Muhammad Rasheed - Mark wrote: "And I’m fine with that." Mitchell Berger - The United States Supreme Court (currently) disagrees with you. The right to control one's own reproduction is seen as a right guaranteed by the constitution, a right that no state may impair. Mark A Miller - @Muhammad... Yes it does figure because I actually grasp the fact the the federal government only has the powers allowed it by the Constitution and the Supreme Court stretches it pretty thin to come up with a way that abortion falls into federal jurisdiction. I think most states would do the right thing. Muhammad Rasheed - Mark wrote: "Yes it does figure because I actually grasp the fact..."
...that the people who are all about 'States' Rights' are committed Deplorables, and you're totally into that. Got it. I was already aware. Mark A Miller - @Muhammad... Wow states’ rights are evil? How many moons circle that world you live in? Mark A Miller - Ah, Muhamned still believes everything is a racial conspiracy against him. The mean old south has a plan to get him. You’re a sad little dude aren’t you? Muhammad Rasheed - Tell you what. I'll stop believing it as soon as you knock it off. Mark A Miller - @Muhammad... Have a nice little paranoid life hammy. I’ll be blocking you now. Gary McCoy - @Mitchell... The United States Supreme Court also once said that slavery is cool. So, there's that. This is why Trump was elected. Muhammad Rasheed - Trump wasn't elected. He cheated. Stop. Gary McCoy - Please, not that again. Muhammad Rasheed - Covering your ears and screaming doesn't make the truth go away, Gary. Gary McCoy - You obviously don't understand what the truth means.